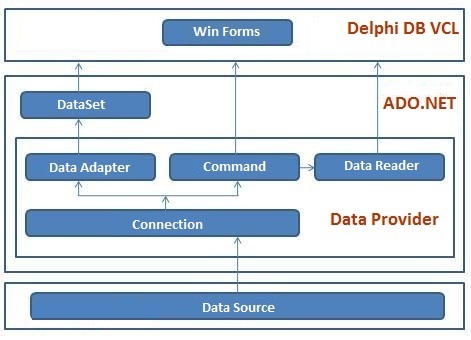 SQLite Data Access Components (SQLiteDAC) is a feature-rich and high-performance library of components that provides native connectivity to SQLite database from Delphi for both 32-bit and 64-bit Windows platforms. SQLiteDAC-based applications connect to SQLite database directly through the SQLite.Net, which is an ADO.NET provider for SQLite. SQLiteDAC is designed to help programmers develop faster and cleaner SQLite database applications with no need to deploy any additional libraries. SQLiteDAC is lightweight and performs well because it is optimized to access SQLite databases directly without adding an OLE DB or Open Database Connectivity (ODBC) layer. SQLiteDAC-based DB applications are easy to deploy, do not require installation of other data provider layers (such as BDE and ODBC), uses ADO.Net technologies and that's why they can work faster than the ones based on standard Delphi data connectivity solutions. - Direct access to SQLite database. Does not require installation of other data provider layers (such as BDE). - Full support of the latest versions of SQLite. - Support for all SQLite data types. - High performance of applying cached updates with batches. This is controlled by UpdateOptions.UpdateBatchSize property. - Fast data retrieval with TSQLiteDataReader component or using Server CursorKind property of the TCustomClrDataSet.